Despite the ruptures and tensions, by the 1860s, some hope of healing the nation still existed. Before Lincoln took office, John Crittenden, a senator from Kentucky who had helped form the Constitutional Union Party during the 1860 presidential election, attempted to diffuse the explosive situation by offering six constitutional amendments and a series of resolutions, known as the Crittenden Compromise. Crittenden’s goal was to keep the South from seceding, and his strategy was to transform the Constitution to explicitly protect slavery forever. 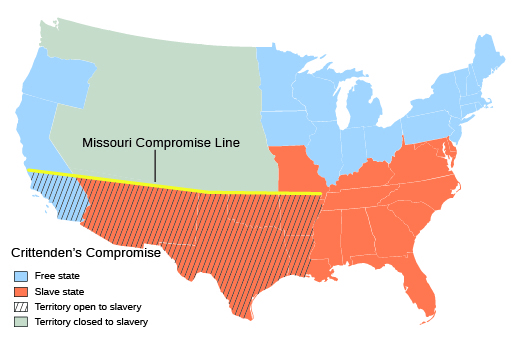 Specifically, Crittenden proposed an amendment that would restore the 36°30′ line from the Missouri Compromise and extend it all the way to the Pacific Ocean, protecting and ensuring slavery south of the line while prohibiting it north of the line ([link]). He further proposed an amendment that would prohibit Congress from abolishing slavery anywhere it already existed or from interfering with the interstate slave trade. Crittenden’s Compromise would protect slavery in all states where it already existed. More importantly, however, it proposed to allow the western expansion of slavery into states below the Missouri Compromise line. Republicans, including President-elect Lincoln, rejected Crittenden’s proposals because they ran counter to the party’s goal of keeping slavery out of the territories. The southern states also rejected Crittenden’s attempts at compromise, because it would prevent slaveholders from taking their human chattel north of the 36°30′ line. On December 20, 1860, only a few days after Crittenden’s proposal was introduced in Congress, South Carolina began the march towards war when it seceded from the United States. Three more states of the Deep South—Mississippi, Florida, and Alabama—seceded before the U.S. Senate rejected Crittenden’s proposal on January 16, 1861. Georgia, Louisiana, and Texas joined them in rapid succession on January 19, January 26, and February 1, respectively ([link]). In many cases, these secessions occurred after extremely divided conventions and popular votes. A lack of unanimity prevailed in much of the South. 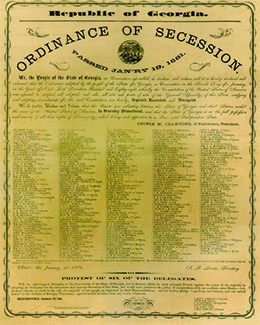 Georgia’s Ordinance of Secession and those of the other Deep South states were all based on that of South Carolina, which was drafted just a month after Abraham Lincoln was elected. Indeed, by the time of the Corwin amendment’s passage through Congress, Confederate forces in the Deep South had already begun to take over federal forts. 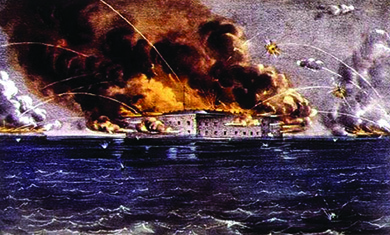 The loss of Fort Sumter, in the harbor of Charleston, South Carolina, proved to be the flashpoint in the contest between the new Confederacy and the federal government. A small Union garrison of fewer than one hundred soldiers and officers held the fort, making it a vulnerable target for the Confederacy. Fire-Eaters pressured Jefferson Davis to take Fort Sumter and thereby demonstrate the Confederate government’s resolve. Some also hoped that the Confederacy would gain foreign recognition, especially from Great Britain, by taking the fort in the South’s most important Atlantic port. The situation grew dire as local merchants refused to sell food to the fort’s Union soldiers, and by mid-April, the garrison’s supplies began to run out. 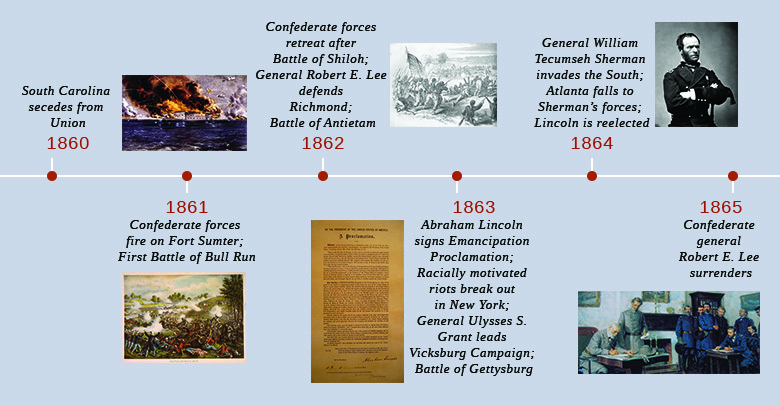 President Lincoln let it be known to Confederate leaders that he planned to resupply the Union forces. His strategy was clear: The decision to start the war would rest squarely on the Confederates, not on the Union. On April 12, 1861, Confederate forces in Charleston began a bombardment of Fort Sumter ([link]). Two days later, the Union soldiers there surrendered. The Confederacy’s attack on Fort Sumter, depicted here in an 1861 lithograph by Currier and Ives, stoked pro-war sentiment on both sides of the conflict. While most slaveholding states joined the Confederacy, four crucial slave states remained in the Union ([link]). Delaware, which was technically a slave state despite its tiny slave population, never voted to secede. Maryland, despite deep divisions, remained in the Union as well. Missouri became the site of vicious fighting and the home of pro-Confederate guerillas but never joined the Confederacy. Kentucky declared itself neutral, although that did little to stop the fighting that occurred within the state. In all, these four states deprived the Confederacy of key resources and soldiers. 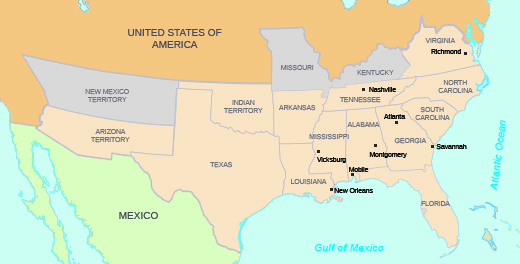 This map illustrates the southern states that seceded from the Union and formed the Confederacy in 1861, at the outset of the Civil War. The Origins and Outbreak of the Civil War by OpenStaxCollege is licensed under a Creative Commons Attribution 4.0 International License, except where otherwise noted.